Guests say Pat is an interesting guy with a wealth of fishing knowledge from around the world. Who could disagree. 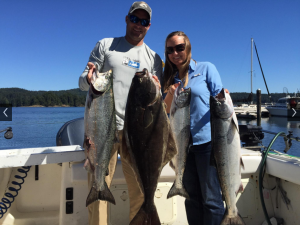 He’ll put you on some quality halibut fishing even on those relatively slow days. We’ll definitely be back halibut fishing with Pat again. A guest of Bluefin fishing went out with Pat whilst staying in the Sooke area with family. Whilst the men in the party had done some fishing before, she had not. All the guests took their turn on the reels. 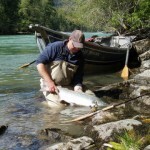 The guests caught a variety of big salmon, and halibut all to their quota on a very slow day for fishing. (The guests based these comments on the results of other boats they saw in the area). The guests also saw orcas otters, sea lions and seals. Pat, as others have already said, is an excellent halibut fishing guide with a dry wit and excellent command of his boat and everything going on around him. Book it, you won’t regret it. Your guide Pat Williams will treat you to the most wonderful day on the ocean. Bluefin Fishing guests have raved about how they caught their limit of spring salmon within four hours of leaving the docks. They also noticed the low number of catches that the surrounding boats were experiencing on that same day. Pat is known as a fantastic host, guests call him friendly, funny, and professional. 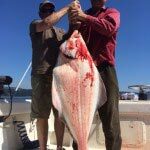 If you’re in in Sooke fishing for halibut, Bluefin Fishing Charters know exactly what to do to get you a fish. You’ll have a fantastic time fishing for halibut. 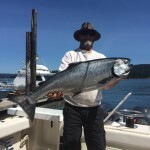 Pat comes highly recommended to anyone looking to fish in the Sooke area.